May 31, Newport, RI – ‘The Meeting Room,’ an installation by world –renowned artist and architect Maya Lin, was dedicated and opened to the public today in Newport’s Queen Anne Square. The Doris Duke Monument Foundation (DDMF), an offshoot of the Newport Restoration Foundation (NRF), presented the installation and revitalized park to the City of Newport as a gift in honor of the memory of philanthropist Doris Duke. Duke championed Newport’s historic preservation and left an enduring legacy of historic architecture. The installation also honors the effect of historic preservation as a catalyst for community revitalization. “We are delighted to present this gift to the City of Newport.,” said Pieter N. Roos, Executive Director of the NRF. “When Doris Duke founded the Newport Restoration Foundation she set in motion a movement of restoration and preservation for which Newport is known. Through this project our trustees saw it as both important and necessary to continue with Miss Duke’s vision and establish what our board President, Mrs. Robert Charles, has termed preservation for the future,” Roos added. ‘The Meeting Room’ was designed by Maya Lin, artist and designer of the Vietnam Memorial. Lin was chosen for her skill in creating installations sensitive to the context of the site. Edwina von Gal, a leading national landscape architect, and Nick Benson, distinguished local stone carver from the John Stevens Shop, collaborated on the project. ‘The Meeting Room’ consists of three foundations, all representing historic uses of the property. Text from historic documents has been carved in the thresholds of each. The prominent feature in the installation is the water table, a signature of a Maya Lin design, carved with a historic quotation from the Rhode Island Charter of 1663. In addition to the elements of the installation, the revitalized Queen Anne Square has over 3,000 square feet of new green space; 24 additional trees; 11 benches and additional seating along Thames Street and on the foundation walls; environmentally-friendly LED lighting; and free WiFi. The creation of Queen Anne Square represented one of Doris Duke’s most significant public works in Newport. Undertaken between 1976 and 1978, the idea for Queen Anne Square was developed in collaboration with Trinity Church to create a town green in what was a congested retail, commercial and warehouse district. 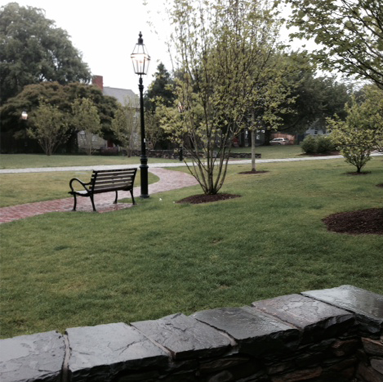 Completed with funds from the NRF and Doris Duke, the upper area was deeded to Trinity Church while the lower portion was deeded to the city for public park use. About Doris Duke Monument Foundation (DDMF): Formed as a 501(c)(3) non-profit organization, the Doris Duke Monument Foundation (DDMF), is an offshoot of the Newport Restoration Foundation (NRF), currently drawing from the NRF’s board of trustees and its staff. It has raised funds for the project at Queen Anne Square through a combination of private and foundation support for both construction and future maintenance. Major gifts have come from the Doris Duke Charitable Foundation, Alletta Morris McBean Charitable Trust , Hamilton Family Foundation, Prince Charitable Trusts, Rose and Charles Dana, van Beuren Charitable Foundation, and the Newport Restoration Foundation. The DDMF will become a self-supporting friends’ organization which will oversee maintenance and administration for the park in the future. Funding for “The Meeting Room” has been raised through a combination of private and foundation support for both construction and future maintenance. Formed in 2014 as a 501(c)(3) private foundation, the Queen Anne Square Maintenance Trust (QASMT) was created to support ongoing maintenance of Queen Anne Square and the public art installation known as "The Meeting Room". The foundation's goal is to ensure the park's longevity and beauty for locals, visitors and future generations.